Cairn Terrier is a rather spunky little creature. They are full of wit and can be aggressive and bold when they need to be. They do not enjoy sharing the limelight with strangers or other dogs. While they can be quite stubborn canines, they do enjoy being with their families and can be sensitive at times underneath that tough exterior. Making great house pets, they will require some time during the day to expend some of that high energy level they bode. The Cairn makes a wonderful watchdog despite their small appearance and can bark at times. They are natural diggers, love to hunt and go exploring. They without a doubt get a thrill out of chasing small vermin and sometimes other dogs. Their personalities are one that bodes a lot of character, but they are still well known for being very loyal and working canines. Some very active thing come in small packages, and such is the truth when referring to the Cairn Terrier breed of canines. They will need to have a owner or reside with a fairly active family. Running or walking on a leash is suffice as long it can occur on daily basis. They would prefer to have time to run, play or chase in an open field whenever possible. They can adapt to cold or warm climates, but residing indoors is preferred by the Cairn Terrier. Possessing a wire fur coat, they will need groomed on a weekly basis to keep their coats free of any debris. 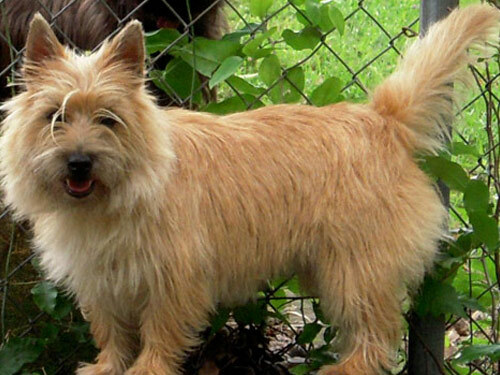 Other household pets may become the focus of the Cairn Terrier as they do not enjoy other small animals in their territory, but they can be friendly with other small hounds. One great characteristic of the Cairn Terrier is that they do not run into many major health concerns like the vast majority of other small dogs tend to. Some minor concerns that can occur along the way are glaucoma, portacaval shunt, CMO and ocular melonosis. GCL can develop in very rare occurrences, which is a condition that can be rather serious involving the hound’s brain. Some vets may advise that you have the Cairn Terrier screened for the GLC condition to rule out any future developments. They are generally around thirteen to fourteen pounds as full grown dogs and can reach an adult height of nine to ten inches tall. Deriving sometime in the fifteenth century, the Cairn Terrier is a breed is one that has earned a reputation for being exceptional hunters. They were utilized to hunt badgers, fox and otters alike. Bred in a wide range of fur coats colors from browns to shades of red, they were noted as a form of Scottish Terrier for quite some time. In the late 1800’s they began to earn fame as show dogs, and at the time were referred to as the Short-Haired Skye canines. The white ones grew in fame in England very quickly and the general public mostly notices the Cairn breed as the type of dog that played the infamous role of “Toto” in the Wizard of Oz film.